Are you an egghead iPad user like me? Do you bring your iPad into the kitchen to follow recipes? Or maybe you bring it out to the garage and fix stuff? My manager asked me how I use my iPad and I could only answer, “Well, I like to read PDFs and write notes in the margins. That’s my primary use.” And then I realized how academic I’ve gotten with my iPad use. Is there a standard ePub format for notes? Do you like old book smell? Cool: what app is that? I’m happy we found each others blogs and I hope to read more! I can’t tell from this photo but are you using a stylus to write notes on your pdfs? The range of available colors makes them fun for people to select their favorite color. 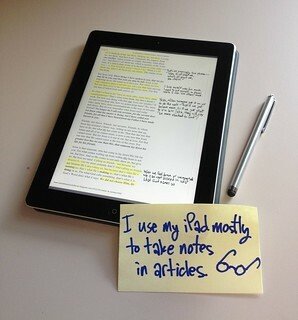 The app I use to write notes, Goodreader, is mentioned in a previous comment on this blog post.